This sophisticated set of cast iron cookware makes the camping staple right at home in your kitchen. There's a reason cast iron is a classic wilderness cooking tool: It's non-stick, easy to clean, virtually indestructable, and maintains an even temperature. This sophisticated set will find itself right at home in your kitchen, transforming even gourmet chefs into happy campers. 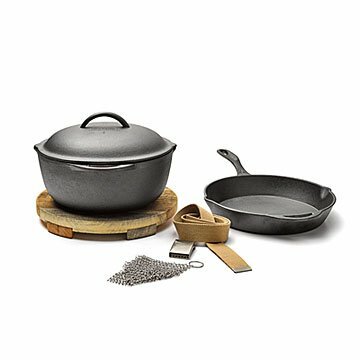 It comes with a pot and skillet, a lid that fits both, and a rustic, reclaimed wooden trivet that protects your countertops while bringing a spirit of adventure to your table. The set even comes with a metal mesh to make cleaning up a breeze. Made in China. Wash with warm soapy water. Rinse and dry thoroughly. Using your hands, apply a thin coat of vegetable oil to inside and outside of all pieces. Bake upside down at 325 degrees for 1 hour with aluminum foil on lower rack to catch drips. Turn off heat and allow pan to cool completely before removing from oven. Cleaning Instructions: For best results rinse pan with hot water after cooking. For stuck on food, scrub with our stainless steel cleaning mesh, rinse and dry thoroughly. To prevent rust, lightly coat the cooking surface with cooking oil. Cover with a paper towel when storing to prevent dust from attaching to the oiled surface. 8": 15.5" L x 8.75" W x 7" H; 12 lbs. 10": 18" L x 11" W x 8" H; 18 lbs. 12": 19.5" L x 13" W x 10" H; 28 lbs. See the complete list of measurements for the Cast Iron Cooking Set. Every kitchen needs some cast iron pieces! Wonderful to cook just about anything in.